Before discussing this controversial topic, I strongly urge you to first read my blog Sexual & Gender Ambiguity. That blog is my personal foundation and experience on the subject of pro-life, abortion, and hate-crimes. Those who know me really well know that I do not shy away from ANY topic of conversation…even if it is typically socially hyper-sensitive! But OH MY, I could NOT resist this excellent t-shirt and retort (borrowed from a friend of a friend)! 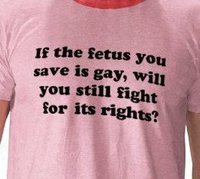 I would add to the t-shirt, “If the fetus you save is gay, ethnically mixed, intersexed, and future Muslim President of the United States…will you still fight for its rights?” So…DIALOG anyone? Not heated bashing, but dialog please. Thank you.